During the bloody Salvadoran Civil War (1979-1992) between the military government representing the 12-family oligarchy of wealthy landowners, and leftist forces representing mostly impoverished peasants, US-supported government death squads terrorized, tortured, murdered and disappeared thousands of civilians, especially targeting students, intellectuals, and Indian people in the rural areas. By the time the UN-brokered peace agreement was signed, it’s estimated that more than 75,000 people had been killed and more than half a million refugees had fled to the US. In this lovely bilingual collection of autobiographical poems, young Jorge tells the story of how he and his father, fleeing from the war, arrive in San Francisco. Eventually, the rest of the family will join them, but for now, father and son, leaving in the middle of the night—and without saying goodbye to anyone—must travel alone. next to me on the river bank? I have a yo-yo that makes me crazy but I can’t stop playing yo-yo in the mornings yo-yo in the middle of the day yo-yo in the afternoon yo-yo at night yo-yo yo-yo yo-yo I dream yo-yo I walk yo-yo I eat yo-yo I am a yo-yo. The Spanish is wonderful, depicting Jorge’s struggle and emotions of his abrupt immigration to San Francisco; the translation was most likely accomplished from Spanish to English. I especially like the way the Spanish and English versions alternate on each spread, with both languages presented as equal in importance. 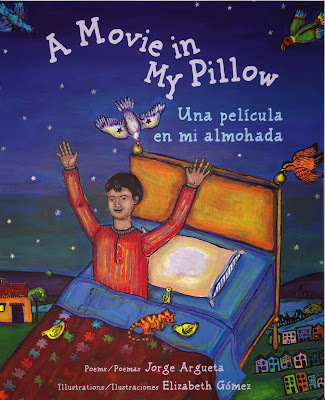 In A Movie in My Pillow / Una película en mi almohada, Argueta gives young readers insight into the one of the most difficult experiences a child can have—being uprooted from your homeland and transplanted far away to a very different place. For young Jorge, landing in “la misión” provides him with a world of adventures and enough cultural connections to El Salvador to make his transition a little less traumatic than if he had landed somewhere else. This book is a welcome addition to a collection of stories about the immigrant experience and is highly recommended.